Facts aren't going to stop our Halloween fun. Not a chance. Sure, plenty of "scientists" will say that dinosaurs never coexisted with man, but whenever we think about ancient history, we like to think about cave men riding around dinos and having a real good time! There can't be anything wrong with that, can there? 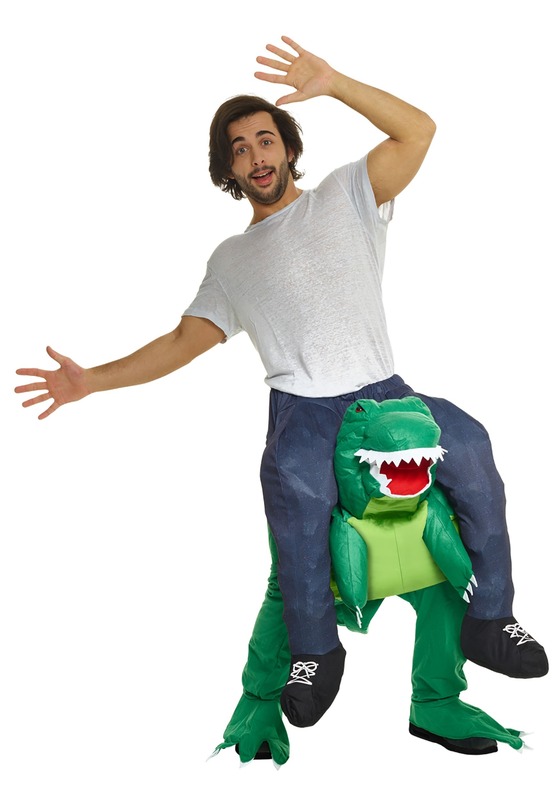 So naturally, we're very proud to offer this delightful T-Rex Piggyback costume! Yes, if you too daydream about dino rides, well, it won't have to be the thing of fantasy anymore. Not when you get this effect costume! As costume pants that are styled to make it look like you're riding a miniature soft sculpt T-Rex, it creates the illusion of you being a prime Rex rider. Cool! And with one-size-fits-most sizing for adults—anyone, anywhere can tame a dinosaur for a ride! So, just what will you do when you become a T-Rex rider? You could rule the cavemen. Or traverse history to bring dinos back to the modern era. Or just have a really epic time at your costume party! With this costume, the possibilities are endless and the only limit to the fun is your own imagination and creativity. And since you're eyeing this costume, we think you're already set in the department!